Sara wasn't sure she wanted to return her hometown but when her Nonna was diagnosed with Alzheimer's, she knew she had no choice. She left a year ago with her head down and shamed because her fiancé called off the wedding the day before. Colton has always thought highly of Sara and when she moves back to town, he wants to make a move. The only thing is that Sara blames him for her ex leaving her. Colt's done a lot of things, but he's not taking the blame for Tagg's straying. As Sara and Colt work out their past issues, they both realize that what you really want may be standing right in front of you but it still takes a lot of time and effort to make it work. Then There Was You is an enemies-to-lovers, small town romance between the doctor (Sara) and a cop (Colton), so for me, the story had a lot going for it before it even began. As I read the book, I liked the family aspects to the story and the small town setting where everyone knows everyone else and their business. I liked Sara’s struggle to gain her father’s respect in the workplace and the way that Colton serves his community as the local police chief. But from Sara’s first interaction with Colton, we can feel real animosity and hurt on Sara’s part over the way that Colton treated her in the past and this really stuck with me. So as the story develops and we see Colton is a good guy in the here and now (and he really is a good guy), it took me a long time to warm up to him. Then, just when I start liking Colton, he does something weak and stupid and I was back to disliking him. Sara and Colton’s road to happiness is a rocky one but it has a satisfying conclusion. Then There Was You is an enjoyable read and has plenty of good elements and romance but my dislike of Colton probably kept me from loving this book as much as I thought I would. Miranda Liasson loves to write stories about everyday people who find love despite themselves, because there’s nothing like a great love story. And if there are a few laughs along the way, even better! She’s a Romance Writers of America Golden Heart winner and an Amazon bestselling author whose heartwarming and humorous small-town romances have won accolades such as the Gayle Wilson Award of Excellence and have been Harlequin Junkie and Night Owl Reviews Top Picks. 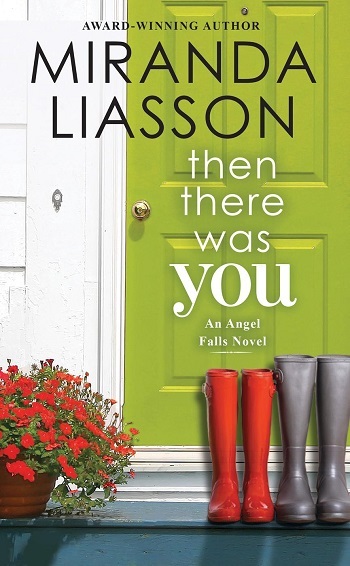 Reviewers on the Wicked Reads Review Team were provided a free copy of Then There Was You (Angel Falls #1) by Miranda Liasson to read and review.